On April 3, two days after the Resurrection Day, the dedication service for a new temple was held in Osan, a transportation hub in the southern part of the capital area in Korea. On the 17th, there were dedication services consecutively in Taebaek, a clean city in the inland area of Gangwon Province, and in Jecheon, North Chungcheong Province, which is known for tourist attractions such as Cheongpung Cultural Properties Complex, Uirimji Reservoir, and Bakdaljae Pass. 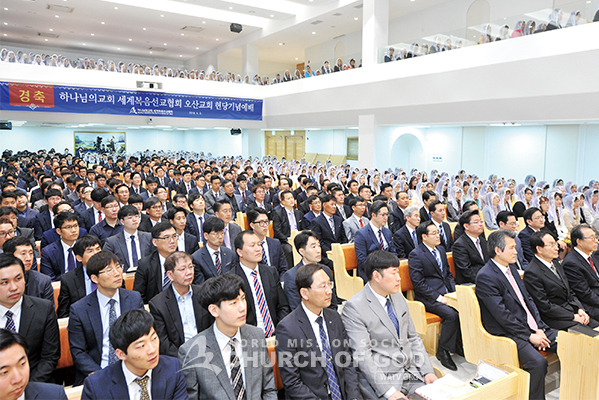 The church members in Osan, Taebaek, and Jecheon Donghyeon gave thanks to God for establishing the new foundation of faith and had the joy of dedicating the temple to the full. Mother blessed abundantly the church members who had worked hard with one mind until the temple was built and prayed that the temple, which was beautifully completed by the unity of all, would overflow with the fruits of unity. Mother also recalled the early days of the Church of God that began as a house church and expressed overflowing joy at the news that the gospel is spreading throughout the world rapidly. Mother prayed for good health and well-being of all the members around the world. “The greatest work in the world is saving mankind as God the Greatest did,” said General Pastor Kim Joo-cheol, who prayed for the growth and development of each church. “When we follow the way of God who led the forefathers of faith like Moses, Joshua, and Gideon, the miraculous work of the gospel will take place as prophesied in the Bible. The teachings of God the Father and God the Mother are the equation of salvation and blessing,” he emphasized and continued, “God established the church, asking us to awaken many souls to the truth of the forgiveness of sins and eternal life. Let us shine the light of the truth in our given positions, always remembering the will of God and take the lead in saving seven billion people” (Ex 3:1–10; 1 Ki 19:19–21; Mt 4:18–20; Isa 60:1–7; Mic 4:1–2; Isa 62:6–7). It features a unique structure of two buildings with five stories above ground and two underground levels. It is located near an apartment complex, and is close to convenient facilities such as hospitals, public offices, and banks, and educational facilities such as schools and libraries, making it easy to communicate and interact with neighbors. As expected, the blood drive was held last March with local people, and street cleanups linked with municipalities received good responses from nearby merchants and residents. To play the role of salt and light in the community, the members of the Osan Church resolved to practice God’s love so that their neighbors, living away from home, can throw off loneliness and tiredness from busy day-to-day life, and can find hope and happiness in the blessing of God, because in Osan and its surrounding area, there are many who have migrated from another region. Located in the inland southeast of Gangwon Prov-ince, Taebaek is famous as the source of the Hangang River and the Nakdonggang River, the lifelines of Korea. The members of the Church of God in Taebaek keep preaching and volunteering diligently, hoping that their new temple will be the source of the love of Christ and the truth of living water. Every winter, snow removal and coal briquette delivery are indispensable volunteer services to this region that is cold and snowy. The members steadily carry out environmental cleanups in summertime around the tourist spots, as the beautiful mountains and the clear valleys of Taebaek get crowded. Through various services, the members will continue to contribute to the development of the communities in Gangwon Province, where the transportation network is improving before and after the PyeongChang Winter Olympics and the number of tourists is increasing. It is a rectangular one-story building with a basement. The church members are communicating with residents actively that the church was flooded with congratulations from its neighbors and merchants who heard the news about the dedication service.